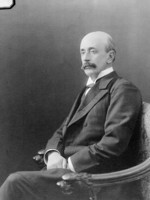 AMES, ALFRED ERNEST, financier and philanthropist; b. 3 Sept. 1866 in Lambeth (London), Upper Canada, son of William Ames, a Wesleyan Methodist minister, and Hephzibah Coleman Whitehouse; m. 30 May 1889 Mary (Minnie) Cox in Toronto, and they had a daughter and a son; d. there 20 Sept. 1934. The youngest of six children, Alfred Ernest Ames grew up in southwestern Ontario at the itinerant postings of his parents, both English immigrants. He attended Brantford Collegiate Institute and in 1881 joined the Merchants’ Bank of Canada in Owen Sound. He subsequently worked for the Ontario Bank and the Imperial Bank of Canada in various locations in the province. Though the young man was determined to advance, his path was not always smooth. While with the Imperial in Toronto in 1884, he was charged with but cleared of fraud on a patent claim. On 1 Dec. 1889, at the age of 23, Ames opened his own investment banking and stockbroking business in Toronto. That same year he had married George Albertus Cox*’s daughter Minnie. A member of the Toronto Stock Exchange (TSE) from 1890, Ames quickly entered his father-in-law’s social and business network, handling much of Cox’s stock-buying needs and managing two of his realty-financing firms, Toronto Savings and Loan and Provident Investment. He also sat on the boards of related Cox companies: National Trust, where he was made vice-president at its formation in 1898, and Imperial Life Assurance, of which he became a vice-president that same year and president in 1903. It was at the National Trust that he developed a working relationship with William Thomas White*, its general manager from 1900. 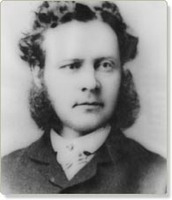 Ames ran his brokerage jointly with Toronto Savings and Provident until he decided, in 1896, to focus on the stock market. To secure a financial vehicle for this business and for clients who bought on margin, he boldly attempted, through a syndicate, to gain control of the Ontario Bank. His efforts fell short, but he cornered enough stock to give him a dominant position and almost unfettered access to loans and investment handling. 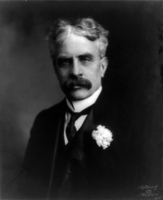 In 1896, when he was elected president of the TSE, he changed his firm’s name to A. E. Ames and Company. His business links with the Cox group and such associates as Joseph Wesley Flavelle, Samuel John Moore*, and Walter Edward Hart Massey* were further cemented by their collaborations at Sherbourne Street Church and other Methodist institutions. In 1898 Ames joined the board of regents of Victoria University, for which he helped fund scholarships, deficits, and endowments, and two years later the board of trustees of Massey Music Hall. Civically, he served from 1901 to 1903 as president of the Toronto Board of Trade, promoted imperialist views, and worked for the Liberal cause. He ran unsuccessfully for reeve of neighbouring York Township in 1902. At the forefront of Toronto’s push into northern Ontario, and through Liberal appointment, he chaired the province’s Temiskaming and Northern Ontario Railway Commission from 1902 to 1904. His social status rose accordingly. In 1900 he had acquired as a summer home Glen Stewart, an estate east of the city on Kingston Road, where he and Minnie hosted prestigious events and luminaries. In 1905 and 1906, for instance, Governor General Lord Grey* and Lady Grey stayed there for the running of the Queen’s Plate at the nearby Woodbine Park racetrack. Along with other financiers, among them Cox associate Edward Rogers Wood*, Ames belonged to the rising generation of brokers who in the 1890s had begun moving investment capital into new industries, utilities, and resource development. He became an executive and director of several companies and in 1898 joined the syndicate that bought the capital stock of the department store founded by Robert Simpson*. An early automobile enthusiast and owner, he was a founding director of Woods Motor Vehicle and Canada Cycle and Motor [see Thomas Alexander Russell]. In 1899 his firm offered its first industrial issue, Dunlop Tire and Rubber Goods. Ames borrowed heavily not only from the Ontario Bank but also from members of the Cox circle, using his influence and position in the family in a self-interested and less-than-transparent way. With the Ontario Bank still under his thumb, in 1902 he was instrumental in organizing the Metropolitan Bank, a short-lived but successful institution that lent large sums of money to brokerage firms such as the Royal Securities Corporation, then managed by William Maxwell Aitken*, and to Ames for his own speculative ventures in the stock market. The bank was supervised by Frank Wilton Baillie*, managing director of Cox’s recently chartered bond-trading firm, Dominion Securities. Ames’s aggressive ventures and practices, however, were ill-timed. During a financial downturn, the failure of some American issues acquired by his company led to its “sensational” suspension of payment on 2 June 1903 and much negative press, a humiliating setback for this ostensibly moral Methodist. With the support of his father-in-law (through property purchases, mortgages, and other loans), a mildly chastened but still-indebted Ames was back in business on 13 July. To meet the demands of creditors, a reorganized, joint-stock firm, A. E. Ames and Company Limited, was incorporated in March 1904. The move was disparaged by the Monetary Times, which found the valuation of Ames’s assets “ephemeral,” his business overly “speculative,” and the man prone to gross self-esteem. 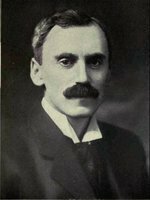 In 1906–7 Ames weathered further criticism precipitated by another market slump, his financial actions that contributed to the failure of the Ontario Bank, a federal insurance-industry commission that exposed his other trading transgressions, and a Supreme Court of Canada finding that he had breached a contract in his dealings with railway contractor and politician James Conmee*. During the investigation of the Ontario Bank, which began in October 1906, its manager drew repeated attention to internal fears that Ames would gain control or, if his access and stock recommendations were blocked, would unload his bank shares, forcing their price down. However, because of the minimal regulation and legal prohibitions of the day, Ames avoided prosecution or major damage to his reputation as a result of the examination. He soon helped to put together a number of large commercial mergers (notably of S. J. Moore’s interests), marshalled equity, and joined several corporate boards. In 1908 he established a separate department to tender for, underwrite, and distribute Canadian government and municipal bonds. 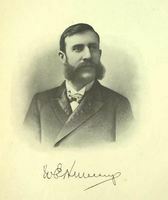 A. E. Ames, Dominion Securities, and Wood, Gundy and Company quickly dominated the bond business in Canada. After conducting his firm’s affairs through a network of correspondents, Ames opened an office in Montreal in 1913. His successes, and the examples of other magnates, were probably factors in the family’s permanent move, about 1910, to Glen Stewart and the small east-end congregation of Beech Avenue Church. The estate, much of which was held by the Coxes, would gradually be reduced through subdivision and sales, though Ames kept enough for a small private golf course. A passionate player who understood the social vitality and professional importance of networking, he was the founder and first president of the Scarboro Golf and Country Club in 1912. By the outbreak of World War I, Ames had achieved prominence in philanthropic endeavours as well as in business, where his practices had achieved a new civility. At Victoria University he was chair in 1909–11 of the library’s building committee and in 1914–22 of the reorganized executive committee of the board of regents, where, in such matters as operations and appointments, he exerted strong direction. Indeed, within the Methodist Church at large, the overt influence of such wealthy laymen worried the Reverend Albert Carman* and other clerical leaders. Appointed chair of Massey Hall’s board in 1911, Ames was equally devoted to sanitation and public health as a backer of Walter Massey’s City Dairy, which pasteurized milk from the manufacturer’s east-end farm, and of William James Gage*’s advancement of sanitariums. 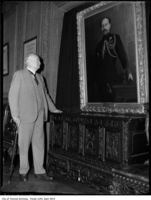 During the conflict Ames was an early advocate of coalition government [see Sir Robert Laird Borden], but it was in the field of wartime finance that he made his mark. With the closure to foreign securities of the London financial markets, up to that point the most important venue for the sale of Canadian stocks and bonds outside the country, Ottawa looked to New York and then, in 1915, to opening the domestic market to dominion securities. Ames astutely understood the potential for his and other firms to handle subscriptions. 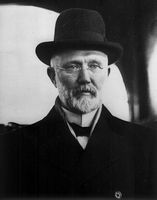 In 1917, conscious of Britain’s enormously successful publicly subscribed Victory Loan, Sir William White, now the finance minister, asked Ames, who was president of the newly formed Bond Dealers’ Association of Canada, to devise a sales strategy for Canada and chair the dominion executive committee that was to oversee the public campaign. White doubted that the country could finance its needs internally, but he would be proved wrong. Ames’s plan for a national organization working through local drives aided by top advertising firms was both brilliant and ambitious. It would remain intact after he was replaced as chair by E. R. Wood in 1918. The loans of 1917, 1918, and 1919 were floated through the sale of Victory Bonds, issued in low denominations to allow small investors to subscribe. “This is everybody’s campaign,” Ames proclaimed; he believed it was a “means of widely educating the public along investment lines and in drawing their attention to the attractiveness of investing their savings in bonds.” Canadians responded with unparalleled enthusiasm, and government bonds of all kinds, as well as corporate offerings, became big business. Aggressive in tendering, promotion, and placement, Ames’s company was a prime beneficiary. By 1920 it had instituted a program of widely distributing brochures and circulars (mostly bond listings) to salesmen and clients. Ames headed one of the top two or three security houses in Canada. Even before 1914, he had transformed himself into an establishment dealer in investments who, unlike Aitken and Royal Securities, avoided exposure to higher-risk industrial issues. As for stockbroking, it underwent significant transition during the Great War and into the 1920s, shifting from a focus on the London market to a more North American position centred in New York. Recognized throughout the dominion, Ames was appointed an honorary officer of the Investment Bankers’ Association of Canada and was a frequent speaker, commentator, and writer on national and international finance. A. E. Ames’s personal interests converged on family (his son, George Albert, badly wounded during the war, had returned in 1919; his daughter, Ethel Marguerite Coombs, died in 1927), Glen Stewart, and the church. 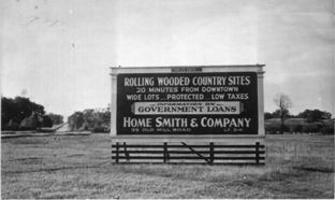 In 1921 a portion of his property went to the city for a golf course. A strong supporter of the union in 1925 of the Methodist, Presbyterian, and Congregational churches [see Samuel Dwight Chown; Clarence Dunlop Mackinnon], he backed the construction two years later of Beech Avenue’s new church, Kingston Road United. At Victoria he chaired the building committee for the United Church of Canada’s new theological school and residence, Emmanuel College, erected in 1930–31, and the university’s reconstituted executive committee in 1931–34. Less engaged at Massey Hall, which faced challenges of programming, deficits, and maintenance, he had resigned as its chair in 1929. Ames’s firm weathered the crash that year, and in the aftermath, with much internal reorganization, it was reportedly the only major investment firm to avoid insolvency. His last years were saddened, however, by the death of his son in 1933. Ames himself died of bone cancer nine months later, leaving an estate worth more than $705,000. Substantial bequests were directed to Kingston Road Church, Victoria University, and the National Sanitarium Association, of which he had been president. A handful of obituaries and archival and biographical sources offer glimpses of this religious stalwart, with no references to his rough climb as a broker. A trim man with a love of walking and golf, he spoke precisely, relished reading, and disdained roisterous behaviour. Hilton Russell Tudhope, a long-time associate, succeeded him as president of A. E. Ames and Company. Alfred Ernest Ames was one of the original builders of a broad securities market in Canada. With other brokers who pioneered the sale of municipal and provincial bonds, he helped give communities and governments access to the funding needed for infrastructure and growth. At the zenith of his career, his skills as an innovative investment banker were critical to the establishment of new markets for Canadian war bonds, a development that permitted the dominion government to devote more resources to the war effort than would otherwise have been possible. At the personal level, Ames could be relentless in his business operations and on occasion push the moral boundaries, behaviour consistent with that of other Methodist businessmen of the day in Canada. Alfred Ernest Ames’s address to the Insurance Instit. 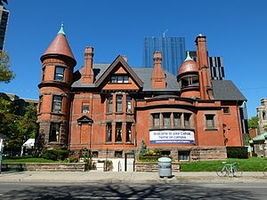 of Toronto on the Victory Loan campaign was published as Some remarks regarding the forthcoming Victory Loan ([Toronto? ], 1917). Reprinted in many newspapers, including the Financial Post (Toronto), 27 Oct. 1917, it has been reproduced as CIHM, no.98859 (mfm.). AO, F 1132 (Cumberland family fonds), Ontario Bank papers, B-2-a, envelopes 1, 3, 4, 11; F 2105 (E. A. Ames & Co. fonds); RG 6-2 (Corr. of the Treasurer of Ont. ), A. E. Ames & Co. file; RG 8-5 (Corr. of the Provincial Secretary), A. E. Ames to W. J. Hanna, 15 Aug. 1916; RG 22-305 (York County Surrogate Court, estate files), no.76107; RG 22-392 (Criminal Assize Clerk, Criminal indictment files), York County, 1884; RG 80-5-0-174, no.14428; RG 80-8-0-1483, no.5588. Arch. of Massey Hall/Roy Thomson Hall (Toronto), Board of Trustees of Massey Music Hall, Minute-books, 1894–1951 (typescript). Victoria Univ. Arch. (Toronto), Fonds 2000, ser.1, box 2; ser.2, box 2; ser.3; ser.6, box 2. Financial Post, 30 Dec. 1911; 28 Dec. 1912; 27 March, 3, 10, 17 April 1915; 20 Nov. 1930; 2 April, 2 July 1932. Globe, 1899–1934. Monetary Times (Toronto), 1902–27. Toronto Daily Star, 1894–1934. A. E. Ames & Co. Limited ([n.p. ], 1969). Christopher Armstrong, Blue skies and boiler rooms: buying and selling securities in Canada, 1870–1940 (Toronto, 1997). Michael Bliss, A Canadian millionaire: the life and business times of Sir Joseph Flavelle, bart., 1858–1939 (Toronto, 1978). Mary Campbell and Barbara Myrvold, The Beach in pictures, 1793–1932 ([Toronto], 1988). Can., Royal commission on life insurance, Report (Ottawa, 1907), 17, 86–91. Canadian annual rev., 1901–28/29. Canadian men and women of the time (Morgan; 1912). Conmee v. Securities Holding Co. (1907), Canada Supreme Court Reports (Ottawa), 38: 601–19. Directory, Toronto, 1891–1934. I. M. Drummond, “Canadian life insurance companies and the capital market, 1890–1914,” Canadian Journal of Economics and Political Science (Toronto), 28 (1962): 204–24. G. P. Marchildon, Profits and politics: Beaverbrook and the Gilded Age of Canadian finance (Toronto, 1996). R. C. Michie, “The Canadian securities market, 1850–1914,” Business Hist. Rev. (Cambridge, Mass. ), 62 (1988): 35–73. National encyclopedia of Canadian biography, ed. J. E. Middleton and W. S. Downs (2v., Toronto, 1935–37). R. T. Naylor, The history of Canadian business, 1867–1914 (2v., Toronto, 1975). Ontario Gazette (Toronto), 24 Feb. 1912: 319. Saturday Night, 12 Dec. 1903, 17 Sept. 1910, 7 Jan. 1922, 29 Sept. 1934. Standard dict. of Canadian biog. (Roberts and Tunnell), vol.2. J. F. Whiteside, “The Toronto Stock Exchange to 1900: its membership and the development of the share market” (ma thesis, Trent Univ., Peterborough, Ont., 1979). David Roberts and Gregory P. Marchildon, “AMES, ALFRED ERNEST,” in Dictionary of Canadian Biography, vol. 16, University of Toronto/Université Laval, 2003–, accessed April 25, 2019, http://www.biographi.ca/en/bio/ames_alfred_ernest_16E.html.